Set includes 16 pieces: 4 x dinner plates (25cm), 4 x side plates (20cm), 4 x pasta dishes (21cm) and 4 x mugs (30cl). 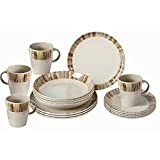 Dinner set. Ideal for camping/caravanning. From the Bamboo range. Set includes 16 pieces: 4 x dinner plates (25cm), 4 x side plates (20cm), 4 x pasta dishes (21cm) and 4 x mugs (30cl). Material: Melamine.